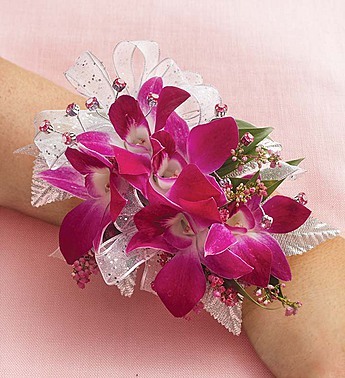 EXCLUSIVE She’s sure to make an entrance at prom wearing this striking corsage! We’ve hand-gathered vibrant and exotic purple Dendrobium orchids with delicate pink calcynia and lush Italian ruscus. Finished off with sheer white ribbon, silver leaves and sparkling rhinestones, it’s a unique surprise sure to add an extra special touch to this unforgettable night!